THE HANWAKAN CENTER FOR PREHISTORIC ASTRONOMY, COSMOLOGY AND CULTURAL LANDSCAPE STUDIES, INC.
Mission Statement: The Hanwakan Center for Prehistoric Astronomy, Cosmology and Cultural Landscape Studies, Inc. is dedicated to the preservation, protection and scientific understanding of shared traditions, oral histories, Native American cosmologies, heritage sites and cultural landscapes the world over. 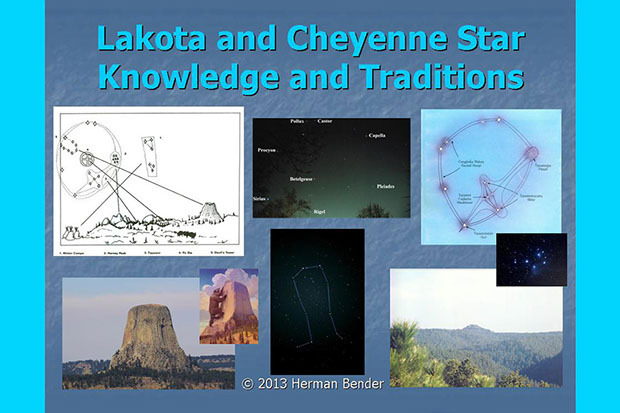 President, Hanwakan Center for Prehistoric Astronomy, Cosmology and Cultural Landscape Studies, Inc.
Herman Bender is an independent researcher with a background in geology and a technical field in industry. 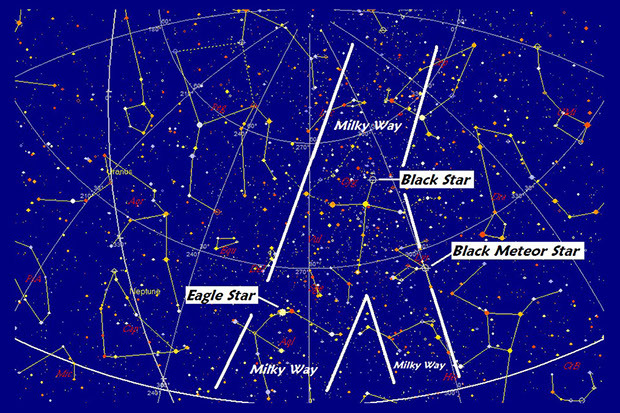 An amateur astronomer and historian, he has been nationally and internationally published in the fields of archeoastronomy, petrofrom research, applied geophysics and cultural landscape studies. Over the years he has conducted many public seminars and classes and has presented at various universities including Princeton and Marquette. Through his company ASHCO (America Septen History COmpany), Mr. Bender has provided cultural landscape and environmental surveys for comprehensive land planning purposes and preservation. He has acted as a consultant to and continues to work with members of a number of Native American tribes including the Northern Cheyenne, Lakota, Ojibway, Potowatomi and Ho-Chunk as a specialist in Plains and Woodland Native American astronomy traditions and related cosmologies. Much of this work is related to Native American land claims and repatriation issues. He is the founder and first past president of the Mid-America Geographic Foundation, Inc. which organized and co-hosted the 1999 International Rock Art Conference at Ripon College in Ripon, Wisconsin. At the conference Herman (as he prefers to be called) chaired the archeoastronomy sessions where he presented one and half papers. He also chaired the field trip committee and conducted numerous field trips which explored the cultural and sacred landscape of southeastern Wisconsin. Interested in history for his entire life, he collects period (Arpmerican) antiques, rare & historic maps and prints, antique pre-kerosene lighting devices, Indian artifacts and antique Oriental ceramics. Regarding antiques and art, Herman has consulted with attorneys and bank trust departments representing estates for twenty years. Over the years and as a public service, he has mounted numerous displays and exhibits utilizing items from his fossil, Indian artifacts and rare maps and print collections. From Herman Bender Power-Point presentation, © 2015.
the Pine Ridge reservation. 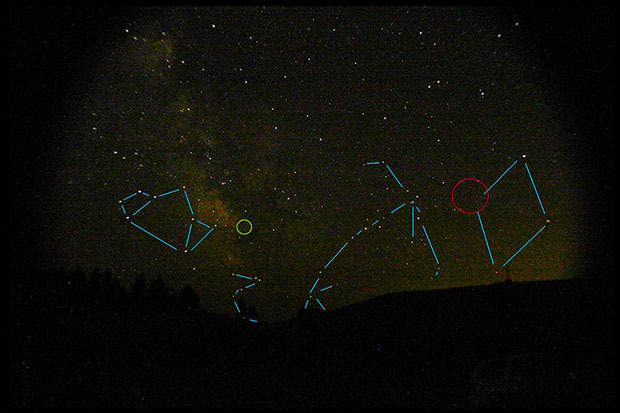 The small green circle indicates the galactic center and large red circle is where the sun rose during the Autumnal equinox ca. 4000 - 2000 B.C. Herman Bender photo, ©2015. 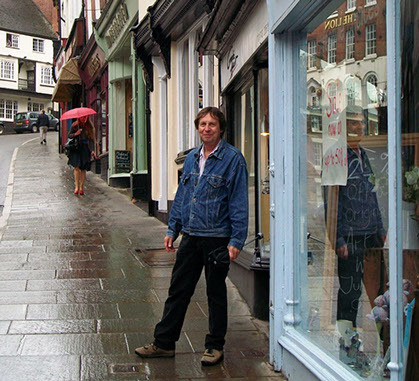 Herman Bender on the street in medievel Shrewsbury, England.